ALAMOSA, Colo. (February 4, 2017) – It was a day of top national times for Adams State University on Saturday at the Grizzly-Buffalo Clash. The Grizzlies secured four NCAA Division II top times with three of those meeting an automatic qualifying standard. Saturday's impressive feat was preceded by two top times on Friday by Ian Kerr in the men's 200m dash and the Adams State women's DMR team of Roisin Flanagan, Jessica Scherrer, Leanne Allen, and Jenna Thurman. On Saturday, Sunayna Wahi's 60m dash preliminary time of 7.43 made her the NCAA DII leader while also serving as a provisional mark. The time also set a new meet record. Wahi followed with a first place time of 7.45 in the finals. Jenna Thurman led the way in the women's 800m run with an automatic qualifying time of 2:10.72 to obliterate the previous High Altitude Training Center (HATC) and meet record. Thurman's time now serves as the top mark at the NCAA DII level. Jackson Sayler and Sydney Gidabuday also finished Saturday owning a top national time. Sayler accomplished this feat in the mile with an automatic qualifying time of 4:15.63. The mark also broke the HATC and meet record. The mile was a strong showing for ASU as Kale Adams (4:19.29) and Brian Glassey (4:24.33) finished second and third, respectively, with provisional times. 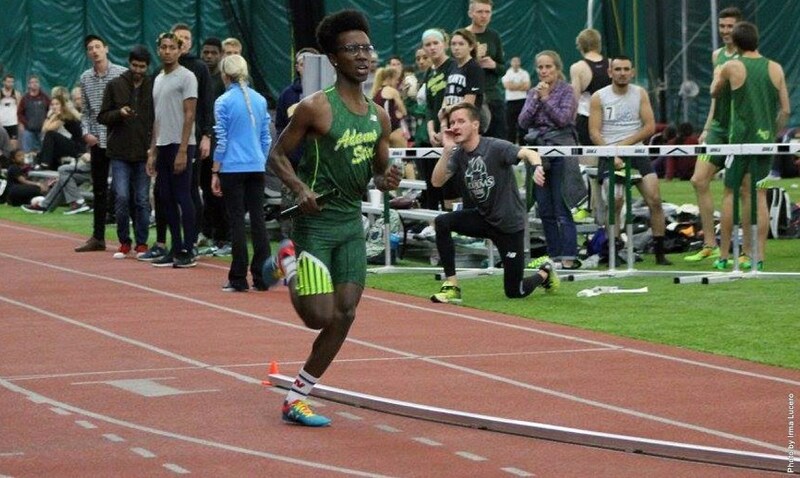 With an automatic qualifying time of 8:28.60 in the 3000m, Gidabuday broke his own HATC and meet record from last year's Grizzly-Buffalo Clash. In addition to the aforementioned standout times, the Grizzlies posted eight additional first-place marks on Saturday. Tom Gifford continues to thrive in the men's 800m run as the junior posted a winning time, and meet record, of 1:54.85. Robert Guinn (1:55.44) and Jake Littlehales (1:55.58) placed second and third, respectively. In the women's mile, Malena Grover took the crown at 5:18.07. Aden Alemu (5:19.24) and Kaylee Bogina (5:19.62) finished in second and third place. Sadie Baker ran to a provisional, and first-place, time of 10:34.67 in the women's 3000m. The ASU men's DMR unit of Chandler Reid, Sean Fontana, Sayler, and Gidabuday took home first-place with a provisional time of 10:20.24. In the men's shot put, Jonathan Millar edged teammate Sam Reid for first place. Both notched a provisional as Millar posted a mark of 16.91m with Reid taking second place at 16.86m. Brecht Van Waes placed third with a provisional distance of 15.77m. The ASU men's and women's 4x400m relay teams defeated their West Texas A&M counterpart on Saturday. The ASU men crossed the finish line in 3:31.41 to narrowly get past the Buffaloes who clocked a time of 3:31.75. The ASU women's relay squad finished in 3:56.12 for first. The race remained close until Jessica Scherrer's late kick as the anchor leg to push ASU ahead for good. Micah Ballantyne obtained a provisional mark with a runner-up finish of 6.78 in the men's 60m dash as Maggie Carrico notched her first collegiate track win in the women's 400m dash exhibition. Carrico posted a time of 1:03.25. The meet concluded with the ASU men defeating West Texas A&M, 73-57. However, the West Texas A&M women left the HATC with a 72-58 win over the ASU women. Combined team scores resulted in a narrow 131-129 win for Adams State. The Grizzlies remain home next weekend for the Adams State NCAA Qualifier on Feb. 11th. Action is scheduled to begin at 10am. Click here for a meet schedule.